Boston MA developer iZotope has forged quite a reputation for hitting the nail squarely on the head. 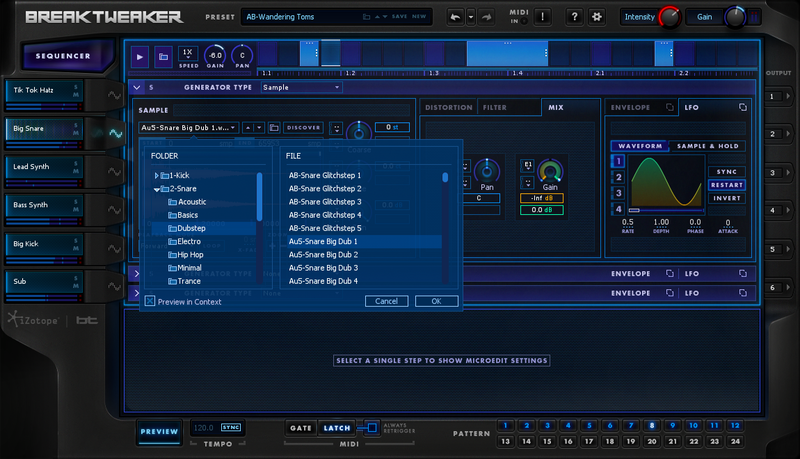 On launch, its Ozone mastering suite received praise left and right for the wealth and quality of audio-enhancing modules presented, while audio-repair tool RX is an essential part of many a production pro's arsenal. However, the company also appears adept at devising shiny new hammers. 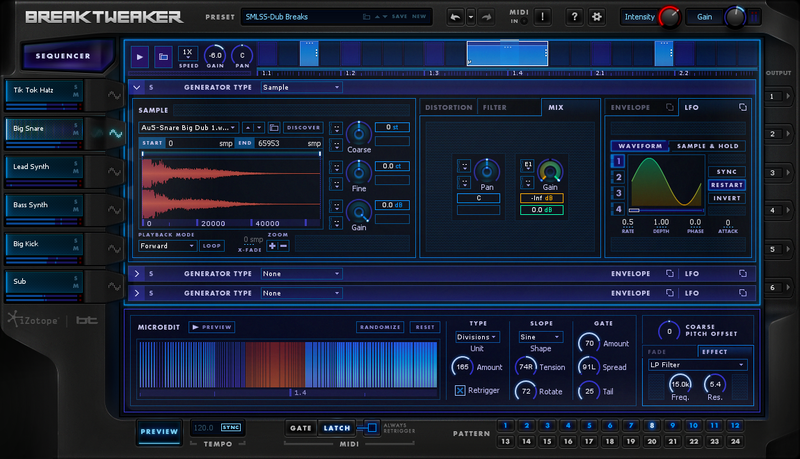 More elegant than a Birmingham screwdriver is Stutter Edit, a sample-stammering signal processor designed in association with 'name' DJ BT. And this 2014, hyped to the hilt prior to its unveiling at Winter NAMM, we've the latest BT collaboration, the aptly named BreakTweaker. Yep, it's for tweaking breaks, and does it ever. What else? 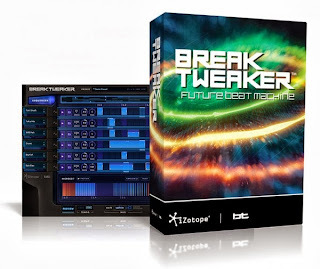 OK, if you can drive a pattern-based sequencer, as graces many a drum machine, and are a dab-hand with a sample sequencer, you'll find BreakTweaker a cinch to master. A 2GB factory library is bundled to get things going and it features a healthy variety of phrases, provided you view dance-centricity as healthy. Even better, you can drag and drop WAV/AIFF files from your own collection onto the interface, which increases scope in line with the fecundity of your sample-stock. 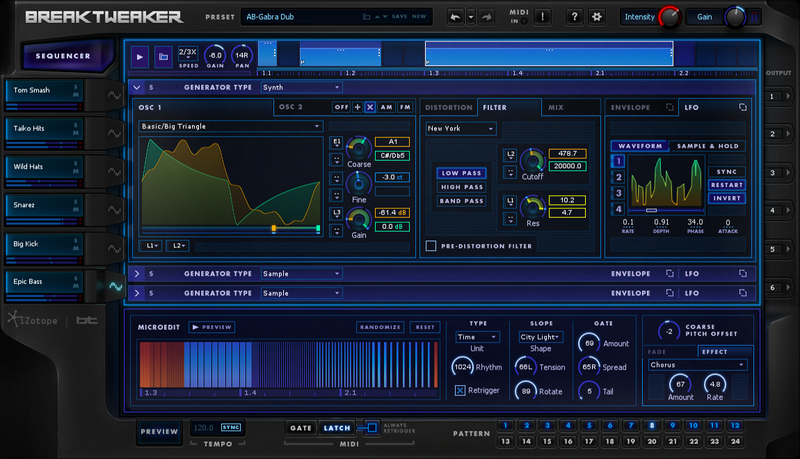 Basic sounds, whether percussion samples or wavetable elements, can be sculpted in the Generator which offers distortion, analog-flavour filters, four LFOs and four envelopes. Overkill? It depends how out-there you want to venture. 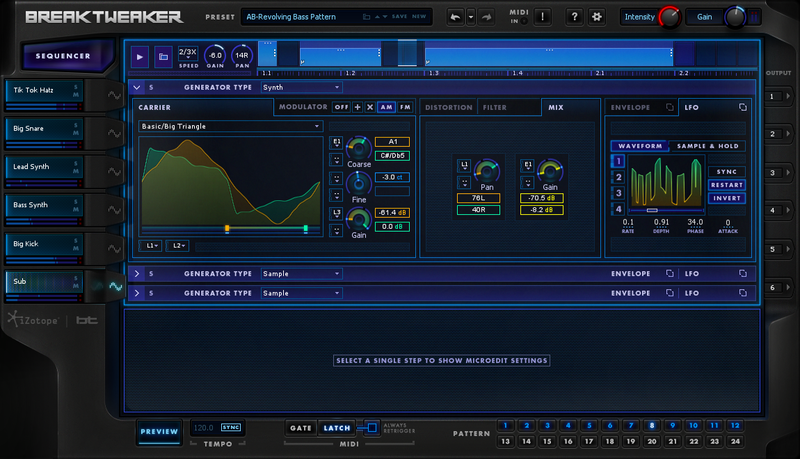 Each Sequencer has six tracks, each with 24 steps, and handles up to three Generators. If this sounds a bit much, fret not. Creating a pattern, complete with adjustable level per step, note length and chokes, is easy mouse-mash. The feature that leaps out is "isorhythm" capability (iZotope's preferred term, likely better understood as 'polyrhythmic'), referencing relative movement in beat components, as well as pitch. Tracks comprising a break can have eccentric lengths and tempi while locked to host DAW tempo, which makes for evolving patterns as individual parts loop, in sync, but at different rates and lengths. Further sound hacking is the function of a MicroEdit Engine, by which events are chopped into chunks, or even into thousands of tiny slices, thus taking on the flavour of pitched, raspy-sounding timbres. Exploration of this hinterland, where our ears perceive rhythm as pitch, was one of BT's prime motivators in developing BreakTweaker and it's certainly a region of sound design ripe for exploitation. 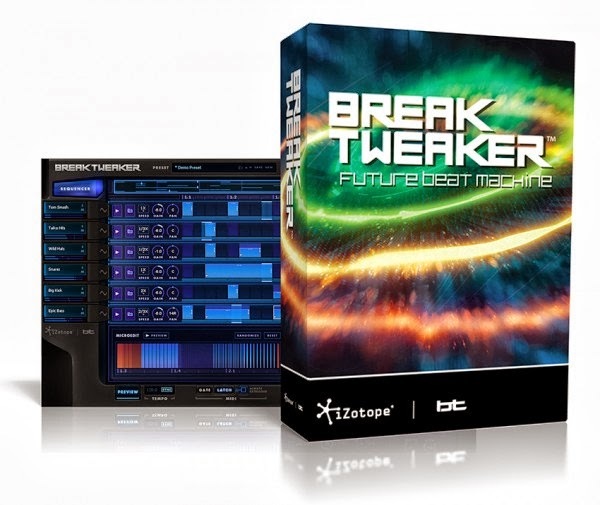 Since launch in late January, BreakTweaker has prompted a good amount of comment online - MuzoBlog's chums at MusicTech.net posted a very positive review shortly after the product hit. Concerns among the wider sound-mangling set extend to becoming locked into genre or style: 'How is it possible not to produce dubstep? '; 'If you've heard BT, you've heard this before' and the like. One commentator describes the product as 'like a cross between Massive and Stutter Edit' (which is hardly a bad thing). 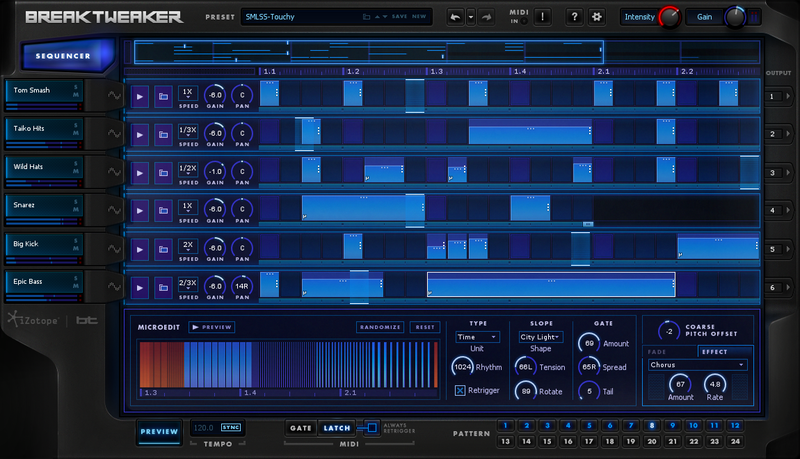 It's true that music software products encourage certain ways of working. Ableton Live, for example, makes working with loops very easy, hence an abundance of loop-based tunes stuffing up SoundCloud. NI FM8 means glassy washes and bell-like clonks; U-He Diva, Vangelis-a-likes; TB-303 clones, acid bass licks. There's way more to BreakTweaker than the developer's spiel suggests. It offers immense scope for radical beat manipulation and functions as quite the kookiest synth-timbre source. Price-wise, it's fair for the facilities and wealth of content supplied - neither bargain-basement nor a rip-off. And three (currently) expansion packs, at $29/$39 each, or bundled in the £199/$299 Expanded product, make for further jollies which cannot be expanded upon here (MuzoBlog was not offered the expansions for evaluation, so... hm). BreakTweaker joins Stutter Edit and sample-sculpting synth Iris on iZotope's wacky farm of sound tools, where oblique strategies breed and bizarre mutants grow. Download the 10-day demo for OS X/Windows and see if you can beat BT with his own fevered imaginings. If you do buy in, bear in mind that video-training outfit Groove3 is already ready with a how-to guide, by Eli Krantzberg, on special offer at $20 (regular $30).